Update: Symphony Xplorer W5 is launced. Its price is 6,990 taka. After the huge success with three entry level Android devices made by Symphony- W10, W25 and W50, they are preparing to bring more Android devices in Bangladeshi market. These two new devices matches with the current lineup in an effective way. The first one, Xplorer W5 is the low budget entry level smartphone positioning even before Xplorer W10. Another one, Xplorer W100 is a fully capable Android smartphone having state of the art features on cheap mobile devices. Symphony Xplorer W5 has an improved 1GHz CPU with 180MB user available RAM. Its display is 3.2-inch TFT capacitive touch screen of 240 X 320 pixels resolution. It also runs Android 2.3 Gingerbread OS. There is a 2MP camera located on the back of the phone. Unlike other 3 devices, it has no front facing camera or 3G support. Otherwise Xplorer W5 has nothing less on its connectivity support list. It has GPRS, EDGE, Wi-Fi, Wi-Fi HotSpot, Bluetooth 2.1 and standard MicroUSB 2.0 support. 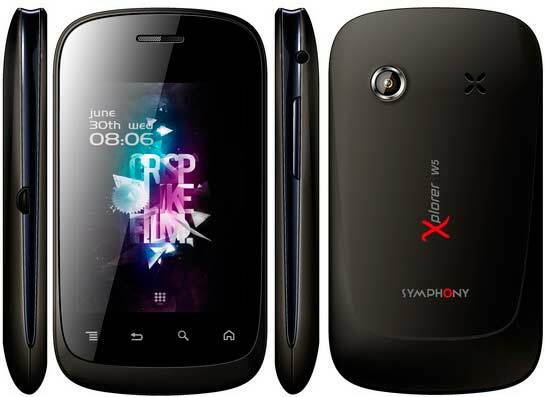 Price of the Symphony Xplorer W5 is still unknown to us. Symphony Xplroer W100 surely has the killer specs. It also has 1GHz CPU like Xplorer W5 but it has the World’s latest Android OS Ice Cream Sandwich built-in. It has much bigger 4.0-inch AMOLED display and 8MP camera on the back. At this moment we have nothing more about W100 specs. Price is the another mystery to us. But we expect Symphony Xplorer W100 will be priced around 15,000 – 18,000 taka. As a complimentary gift, customers will get 4GB memory card with every set.